Relationships: There are about 40 species of true firs in the world, 9 in North America. 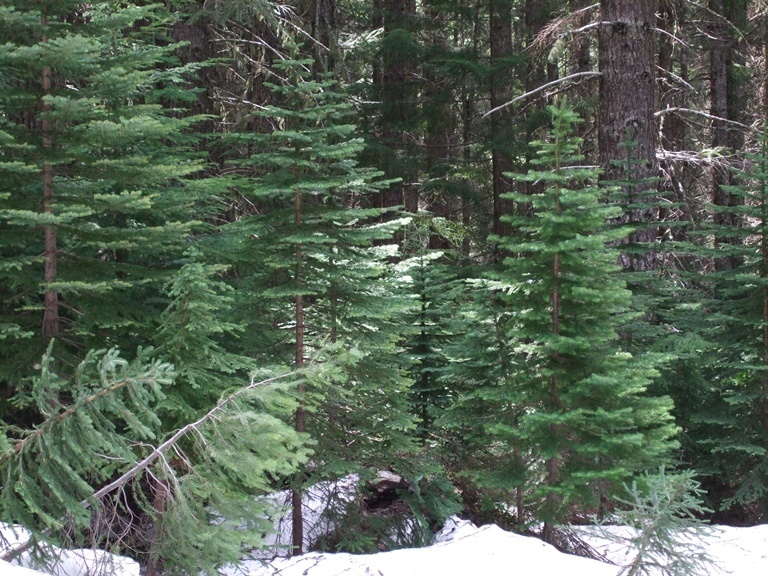 We have 4 in our region but only the Grand Fir, Abies grandis, is common in lower elevations. Distribution: It is widespread in British Columbia and the Rocky mountains reaching down to Arizona and New Mexico in isolated communities. 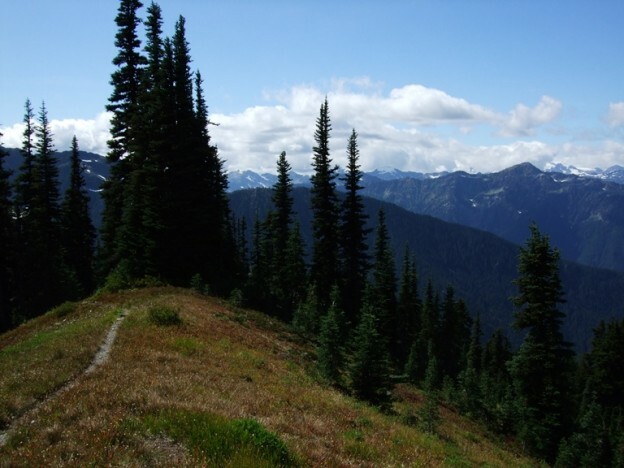 In our region it is strictly found in the subalpine zone of the Cascade and Olympic Mountains. 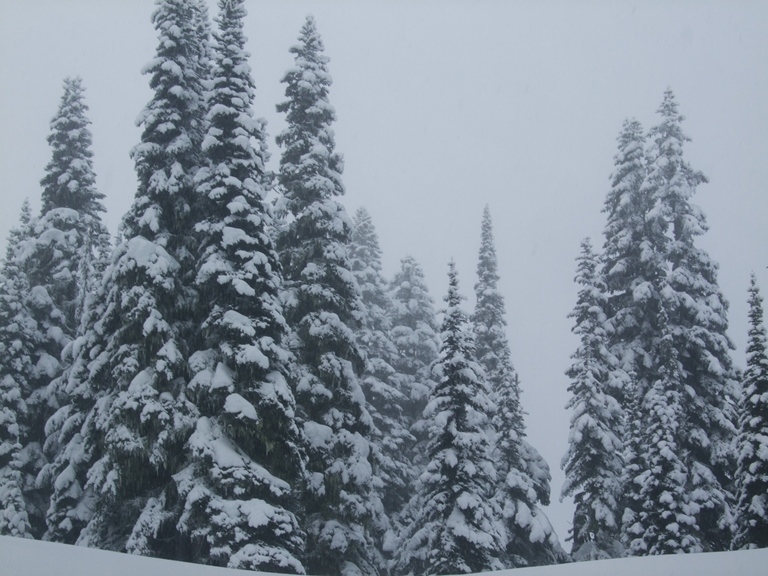 The tall spire-like growth of Subalpine Fir is an adaptation to withstand heavy snowfall. 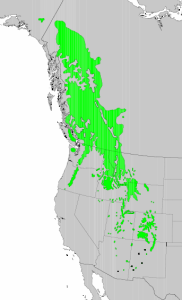 Growth: Subalpine Fir can reach 150 feet (45m) but usually only reaches 60 to 100 feet (18-30m). 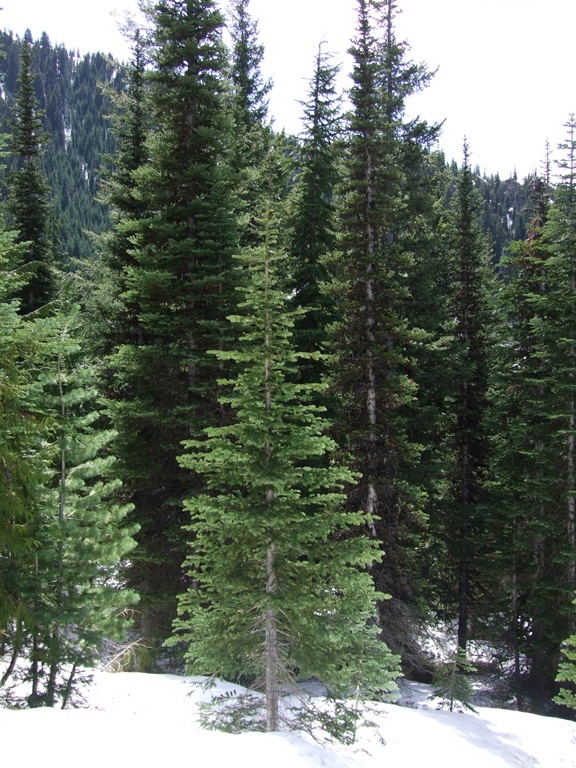 In its natural subalpine habitat, it is often dwarfed and may only grow 1 foot (30cm) in 15 years. 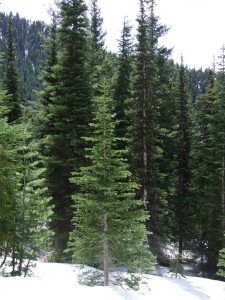 Habitat: Subalpine Fir is adapted to live most of the year under snow and in cold valleys. It can withstand cold air flowing down from large ice fields. This hardy tree may cling to life for 250 years. Young Subalpine Fir trees will actually bend down under the snow and spring up again after the snow melts in summer. 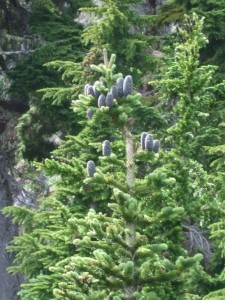 Diagnostic Characters: The foliage of Subalpine Fir turns up along its branches, similar to Noble Fir, but the needles are shorter and tend to be bluish-green. 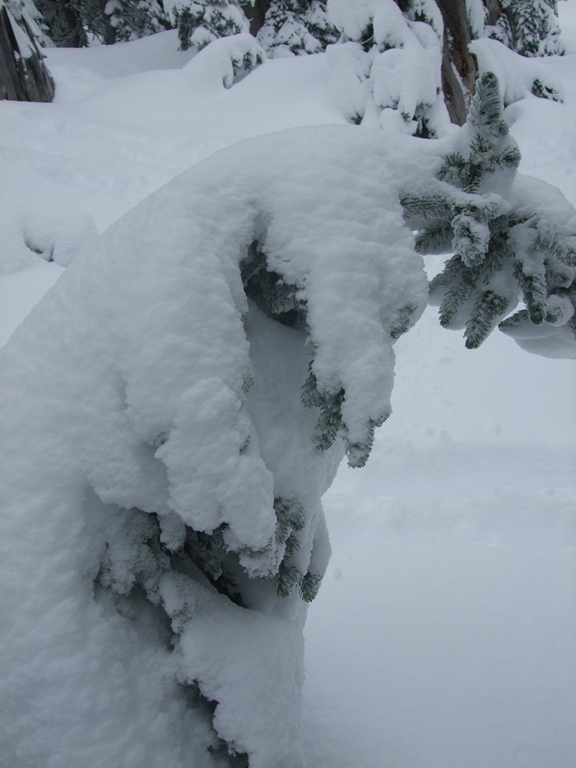 The form of the tree is “spire-like,” very pointy and narrow, an adaptation that reduces the amount of snow that is able to build up on its branches. 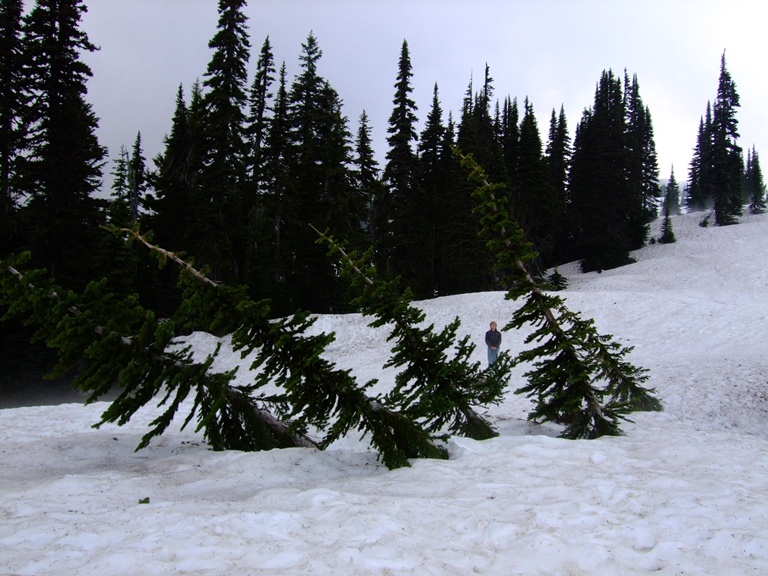 In the Landscape: Subalpine Firs are very attractive growing in drifts in a simulated alpine setting or rock garden. 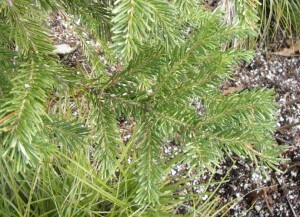 In fact, entire picturesque clumps are sometimes dug in the wild to be transplanted into a garden or made into a bonsai. 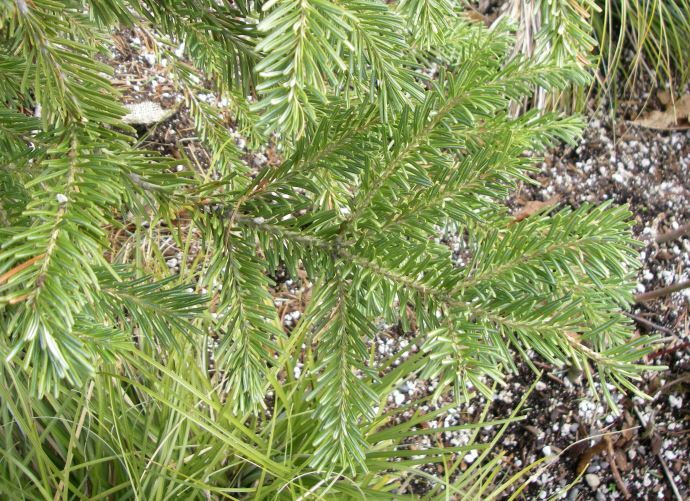 Although some trees are dug legally with a permit, it is still better to obtain nursery grown trees and train them yourself. Phenology: Bloom Period: Late Spring to early summer. Cones mature mid-September. Seed dispersal begins in October. 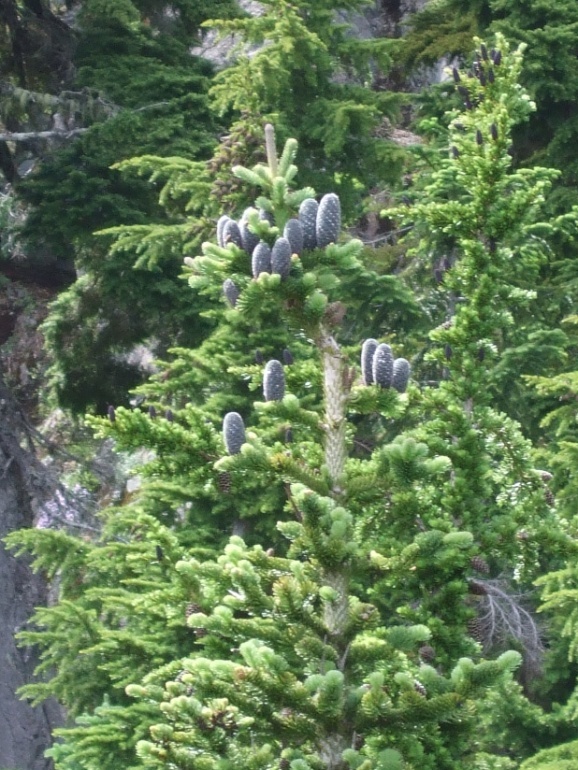 Propagation: Subalpine Fir can be propagated from seed using the same procedures as for other firs. You may be able to filch a few seeds from a squirrel cache, but be judicious and leave plenty behind! 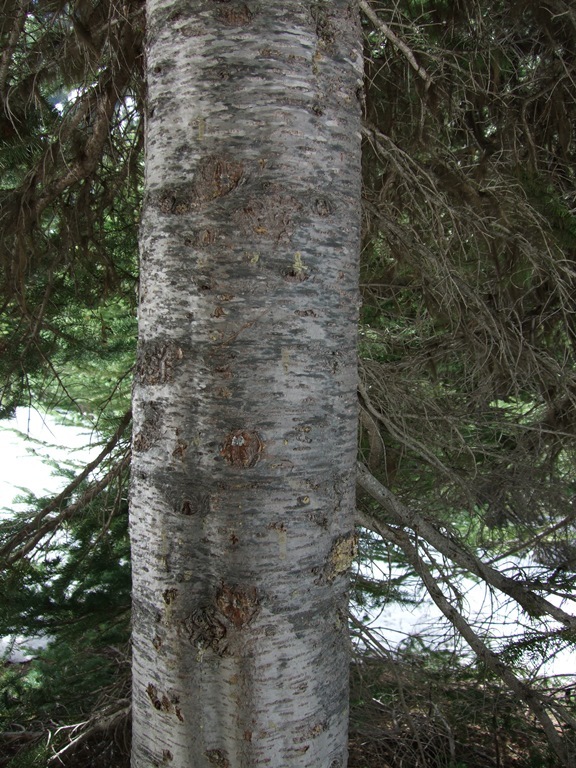 Use by people: As with other high elevation trees, the wood is not used much due to its relative inaccessibility. Use by wildlife: Firs are useful to many animals for cover and nesting sites. 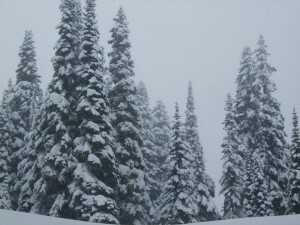 Grouse eat the needles. Deer and elk eat the foliage and twigs in the winter. Birds, chipmunks and squirrels eat the seeds. 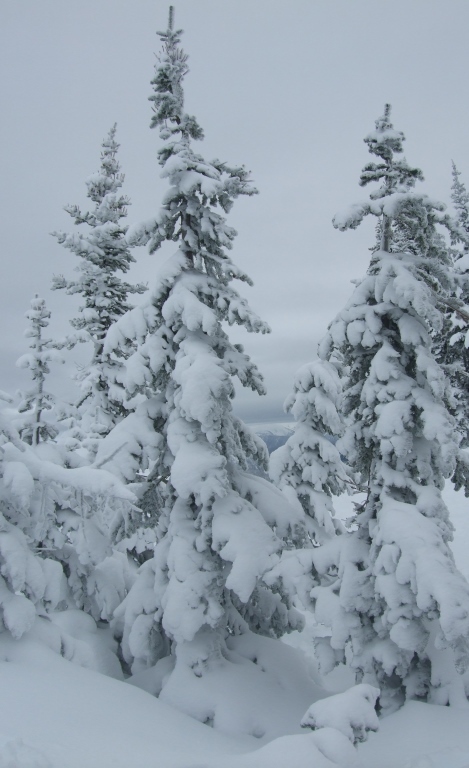 This entry was posted in Conifers on March 19, 2014 by habitatdana.